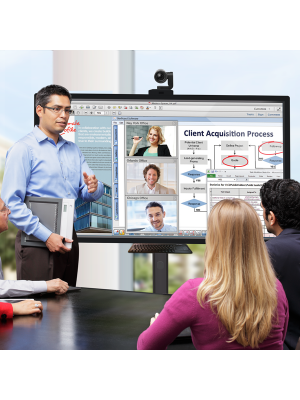 75” interactive screen with multi-touch capability and 4K UHD display. Interactive whiteboard equipped with Silktouch technology that provides an unparalleled user experience. Object-awareness automatically differentiates between objects and gestures for easier use. Pen ID feature facilitates collaborative work by allowing the users to write in different colors. Innovative SMART ink technology ensures legibility of sentences no matter how they are written. Easily preview and switch between the 2 HDMI and other VGA inputs. Option available to connect with personal devices such as; tablets, phones, and Chromebooks. Equipped with proximity sensors, that automatically turns on the Smartboard when people walk in the room. Conveniently accessible panel for instant access to power, volume, and other settings. Energy Star Certified specifications that save energy and reduce the operational cost. Additional features include a SMART Learning Software and a screen warranty of 5 years. 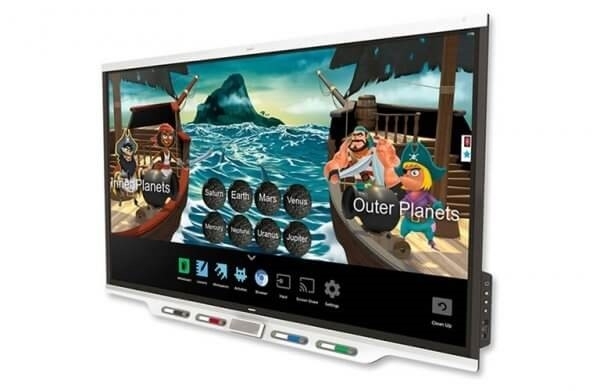 SmartBoard 7075 Interactive touchscreen display composes of state of the art technology to provide an unprecedented experience to the user. It comes with a 75” interactive screen of a 4k UHD display and is equipped with Silktouch technology. Furthermore, it has the ability to automatically differentiate between objects and gestures for more ease during use. 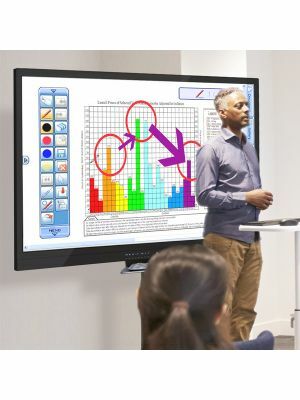 SmartBoard 7075 Interactive Touchscreen display comes with a Pen ID feature that easily supports collaborative work by assigning different colors to different users whilst ensuring legibility of words no matter how they are written whether with a pen or with a finger due to its innovative SMART ink technology. It’s extremely easy to preview and switch between the 2 HDML and other VGA inputs. Moreover, SmartBoard 7075 even has the additional option available to connect with other personal devices such as tablets, phones, and Chromebooks. Equipped with proximity sensors, SmartBoard wastes no time by turning on immediately when people walk into the room. For more ease, a conveniently accessible panel is integrated within its design to adjust volume, power, and other settings. 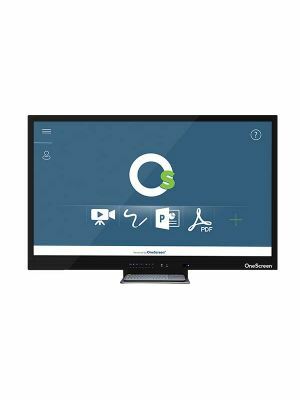 Smartboard comes with energy star certified specifications that ensure maximum conservation of energy and significantly reduce operating costs. Lastly, it has a Smart Learning Software preinstalled and a screen warranty of 5 years. Modern day work requirements are demanding and are pushing individuals across the globe to discover ways to enhance productivity. Saving time is at the heart of all such efforts. Recognizing the need to extract maximum output from the users’ limited time, SmartBoard 7075 has been provided with a proximity sensor which senses your presence as soon as you enter the room and turns itself on. These features save critical time and allow users to start working right away. Devices and platforms which allow the users to connect them to various devices are of maximum benefit. SmartBoard is delivering in this regard as well by enabling the users to connect the system with their personal android devices, computers and chrome books. 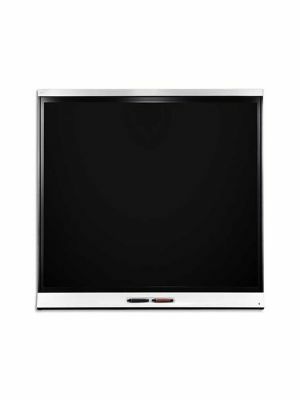 SmartBoard 7075 is the perfect choice for low power consumption and reducing electricity bills. It features Energy Star Certified specifications that save energy and reduce the operational cost. Behavior adjusts automatically to the tool or object you’re using, whether it’s a pen, finger, eraser or palm. Four people can write independently and simultaneously, using different colored ink. In my classroom the use of technology and my comfort level stems from, well I have children myself. Seeing them grow up in a society where technology is there. Realizing, this is where my kids are and this is the tool that they have and I need to jump on board with them and help lead the way. Society has her space here right so after she shares you're gonna give her feedback. We're a K to 12 independent school using the Smart Learning Suite. It's pretty amazing. Every teacher uses it in different ways. Please build the bridge. We love using the Smart Learning Suite because it has all four components of the software and the tools that my teachers use with notebook response to lab and Smart app. Q. What is the function of the proximity sensor in SmartBoard 7075? A. The proximity sensor saves time by switching on the system by sensing the users presence in the room. Q. 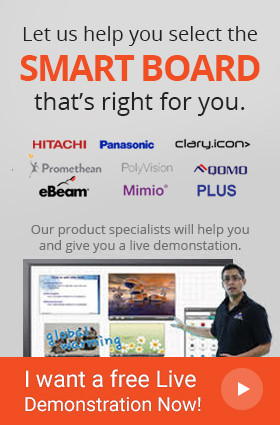 How many number of touch inputs are possible with the Smartboard 7075 interactive touchscreen display? A. There are 16 finger and pen touch inputs possible with the Smartboard 7075. Q. Can SmartBoard 7075 be connected to personal devices? A. Yes, the system can easily be connected to any android, iOS and similar systems. Q. Does SmartBoard 7075 have any warranty? A. Yes, the system comes with a warranty of 3 years. Q. Can multiple users use their pens on SmartBoard 7075? A. Yes, the touchboard allows multiple users to use their different colored pens simultaneously.